Want to extend your marketing campaign to tabletops? These swinging printed counter signs feature a unique, rustic design that's excellent for advertising. Whether they're placed on retail shelving units or on restaurant tables, the displays are easily seen by customers. Each custom printed counter sign features user-submitted artwork in full color and high detail to make the best impression. 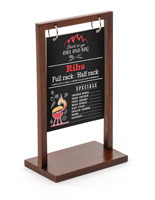 These tabletop ad holders are ideal for featuring menus and promotions close to eye level. Look no further than these printed counter signs for high quality signage and displays. Why use these tabletop advertising displays? Our custom printed counter signs feature photo-quality foam core boards that are lightweight and highly affordable. These are printed with our high quality digital imprint process that creates detailed, vibrant graphics. The printer uses UV light to quickly dry the ink before it can spread to create the most accurate artwork. 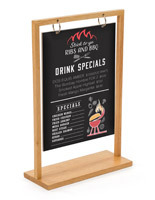 The promotional counter signs have a rustic swinging design that's unique for tabletop signage. While they're not made to sway in the wind, their gentle motion will attract attention in stores, service organizations, restaurants, and bars. Because the advertisers use lightweight foam core boards, they're likely to move with minor air flow. 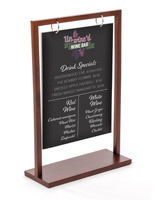 Personalized counter signs are offered as standalone signage boards and stands. This is a great way to feature multiple graphics using the same fixture. The foam core boards have two holes at the top for quickly swapping signage. 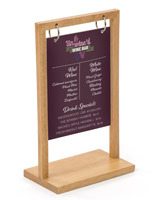 This is excellent for changing marketing campaigns and updating menus without having to buy a new stand. Our sign holders feature attractive wood finishes. The wooden signage displays are offered in light maple and natural brown finishes that mesh with advertisements as well as their surroundings. 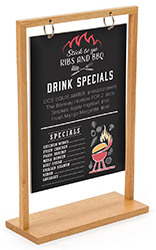 The personalized tabletop signs' modern design enhances advertising in retail stores. Their trendy appearance grabs attention at a low price point. These affordable stands are great for featuring messages like "20% OFF" when placed on top of shelving displays. They're also used for directing customers to the brands they're looking for. On the cashier counter, swinging ads often advertise store credit cards and membership offers. For more custom messaging on the countertop, browse our custom register mats that customers will be sure to see. When used in restaurants, the menu holders make ideal table toppers. Use these swinging displays to feature drinks on the tabletop with rustic décor. At the bar, they can promote the house brew and local favorites. The compact 5" x 7" media size is great for featuring advertisements where other prints would never fit.